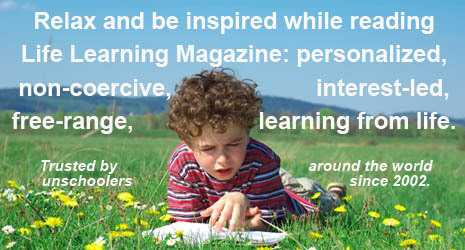 As life learners we strive to give our children the freedom to pursue their interests and passions. We see that they learn quickly and happily – almost effortlessly – when they are caught up in and enjoying what they are doing. It’s pretty easy to let it flow when you feel their interests are worthwhile, but what if you have a hard time seeing the value in what they choose to pursue? Do you catch your breath and eventually demand they move on to something else? Gaming is often an area of interest where many people have a hard time seeing the value. When I realized that playing video games was a deep, passionate interest for my now 12-year-old son Joseph I decided to take an active role. Instead of limiting his playing time in hopes that he would find something “better” to do, I fully supported his interest. I spent time watching him play, chatting with him; I tried it out myself; I helped him find information he wanted. It didn’t take me long to realize that he was constantly learning new things. Here’s what I found, along with some ideas on how you can support and get involved with your child’s interest in video games. Let’s look at reading. Joseph was almost ten when we began unschooling. In school he had struggled to finish assigned early chapter books, but at home in the evenings he devoured 80- page computer printouts of game walkthroughs. With school out of the way he has continued to read game information voraciously – with the occasional fiction book along the way. In fact, video games may well spark an interest in learning to read. Children may see it as their first real purpose for reading. It has been that way for our seven-year-old son – he has been reading game play words for quite a while now. Many games, especially RPGs (role-playing games), have a rich story environment. Spend time with your child and read the text so they can enjoy and appreciate the storyline, not just the action. It’s like reading an animated storybook! A child may see learning how to play a video game as her first real purpose for reading. At some point they will progress past the level where we’re any help – either with skill or suggestions. It’s time for some research! Getting a magazine subscription for the applicable game system is very helpful. They’ll get articles on upcoming games and abbreviated walkthroughs, often with visual screenshots. Player’s guides are great – beautiful art work and answers to just about any question they may have. And don’t forget about the Internet. At first Joseph would ask us to find things for him – guides and FAQs about the game he was playing. But over the last year he has taken to doing this himself. He learned quickly that when searching the internet spelling counts! Now he also finds fan sites and evaluates their reliability based on his knowledge of the game. These skills for finding sources and evaluating their content developed naturally because he wanted information to help him accomplish something in a game, but they are applicable to any research he will do in the future. And over the last few months he’s discovered message boards. Here you can read conversations between players. It may take a bit more weeding out of extraneous information to get to his answer (another useful skill), but it’s worthwhile nonetheless. And if he doesn’t find what he’s looking for, he can post his question directly. This level of research can, in turn, lead to meaningful writing. Players may be interested in writing comments to the gaming magazine they read regularly. As they get comfortable on the gaming message boards they may not only post their questions but begin to answer the questions of others. They may be interested in writing their own walkthroughs and FAQs. This is real writing. While researching games, Joseph discovered a fan fiction website. Here writers post stories based on characters and/or situations from video games, books, movies, and so on. When he noticed his ten-year-old sister writing stories based on her passionate interest in Harry Potter, he passed the site along to her and she has spent many hours reading there as well as writing. Last I heard her current story was over 30,000 words long. I smiled. Things flow very nicely when I don’t try to change the course. Typing is another useful skill Joseph has picked up along the way. He’s never been interested in writing by hand, nor in typical “learn-to-type” software. But when he expressed an interest in online gaming we set him up, got him a keyboard and within two weeks he was typing well! When we asked if he was enjoying it he said it was a dream come true. He had finally found a community of players with comparable levels of interest and gaming skills. Next, let’s look at math. Typically, there is a time component and some form of money in these games. There is also monitoring your characters’ health and level, and anticipating damage and experience points to figure out your chances of surviving upcoming battles and leveling up. Not to mention all the money conversations you’ll have with them as they save up to purchase new games, bargain hunt for used games, or place bids on eBay auctions! The opportunities to play with numbers are endless. The opportunities to play with numbers are endless in computer games. There is also plenty of logic and higher level math. There is also plenty of logic in game play. Many side quests require puzzles to be solved to get useful items or even to continue to the next level. There’s logic in the approach to boss battles, determining weak areas and choosing attacks that take full advantage. There are often mazes to be solved as you move through levels. Even higher level math comes up regularly. One evening when Joseph was 11, he asked me to help him figure out an algebraic formula with two variables from one of his games: (Y / 5) + X. This is an aspect of the game he is just getting into this time around. We discussed the formula and went through the examples they gave in the player’s guide. We talked about rounding. Later I passed him in the hall and he said, “They sure do build up their levels slowly!” You just know he had been pondering the formula and trying out various combinations. I have seen pages and pages of percentage charts in player’s guides. By using these charts a player can build up skill in the classes and parameters they prefer, creating their own unique characters and ensuring a well-balanced party. I’ve seen Joseph pouring over them in deep concentration. In fact, when he was studying the charts for Golden Sun 2, he remarked that they were the most important part of the player’s guide. These statistical charts had six attributes that changed individually based on, from what I could tell, three independent variables for, on average, five possible subclasses. And there were 25 of these charts – one for each of the default classes plus combinations of classes to create complex classes. Whew. There is so much going on in video games that you can discuss – it’s like critiquing a book or a movie. We’ve had many discussions about storylines. Discussions about characters and how they develop. What’s the climax of the game and how is everything resolved? Or is it? The music (some games are fully orchestrated with original soundtracks) and how it helps build the mood. The art (Joseph has created some really beautiful character sketches) and technical advances in graphics. Joseph commented to me a few months ago that what he loves about video games is a really deep story. Games without deep stories make him bored. Fast. Books allow you to read a great story and imagine it. Movies take it another step and bring in the visual element. Video games take it yet another step and allow you to interact with the story. In many games, how you interact with the story determines the twists and turns the plot will take. The replay value is amazing because you can play it multiples times, oftentimes through the eyes of different characters, learning different bits of the story each time. He has come to realize that his passion is not really video games per se, but video games as a medium to immersion in a great, deep story. If I had limited his playing time and not helped him pursue this interest, I don’t think he would have realized this. And I would have been too busy trying to get him to do other “more worthy” things to see it myself. Now I realize that it would have been like me limiting the time he was allowed to read each day. It seems a little ridiculous when I think about it that way. Gamers also learn many things from the game storyline itself. Joseph has developed a great interest in mythology. One summer evening last year we were all sitting around the campfire and I started reading excerpts from The Magical Worlds of Harry Potter by David Colbert out loud. Well, the mythology Joseph knew and related to what we were reading was phenomenal! He would often finish the sentence I was reading. And he would connect it back to some of the games he enjoys playing. And he would connect the games to each other. Even though the games themselves weren’t related, they were all drawing on the same mythological stories as their basis, or as a meaningful basis for naming characters and moves. It was a really fun night! A great game skirts the edge of the player’s level of competence, each new level pushing them to the limit of what they can do, enticing them to learn more. And lest you think that “cheats” are for cheaters, let’s take a quick look at them. When you think of how most games are designed, you realize there are a number of variables that the player needs to keep track of – like health, current location / map, weapons, enemy type / weaknesses etc. The player needs to be on top of all these things to successfully navigate the game. What a “cheat” often does is basically fix one of these variables so the player no longer needs to worry about it – he can concentrate on mastering the others. For example, a cheat may give you infinite health. At first you think, “What a waste; where’s the challenge then?” but look a bit further. Now they can concentrate on, say, learning their way around the level using the map, or practicing battles with their weaker weapons to improve their skills. And they learn that sometimes fixing one variable has unexpected consequences. Other cheats bring the object-oriented code to life. In The Legend of Zelda: Ocarina of Time there are cheats so that you can change the color of Link’s tunic and his size. Simple and meaningless you think. But no – they will likely notice that his tunic color has changed even in the game introduction, not just the game itself...How when they enlarge Link he is bigger than the gate, even the building, but he still cannot enter when it’s locked. How he doesn’t look like he’s moving when he steps because although he takes up most of the screen, the code for walking still moves him the same distance. And in The Simpsons Hit & Run there is a cheat so the car will bounce. “What on earth for? !” you think. But by playing around with it you discover something interesting. When you bounce high over the houses near the edge of the level, you can see behind them. There is nothing there. You have reached the end of the code. The designers never imagined that a user would be able to see past the houses, so they didn’t bother adding anything. It is just empty space. Interesting! These cheats make the code come alive before a player’s eyes. They begin to understand how code works. They may not be able to explain it, but they intuitively understand it. And if in the course of their lives it comes up, they’ll understand the technical terms immediately because they have seen it in action. It will connect to their gaming experience and have meaning. I will never look at cheats the same way again. Now that they’ve played around with the games themselves young people may be interested in learning about programming – either web site development or even game programming itself. Joseph spent some time learning about web site content and development when creating a fan site. It’s a great place to start because there are a number of tools around that don’t require a lot of programming knowledge. He has also developed an interest in game design. We picked up RPG Maker II along with the guide for Joseph last Christmas and he has spent many hours with it. It is not for the faint of heart though. The guide reads like a computer manual but he loves it and each time he makes a major discovery he starts up a new game to put it to full use. I’m lucky enough to be his official game tester! Many people believe that gaming is a passive pastime, but in reality, though it is obviously not physically active (until you try the Eyetoy! ), it is mentally challenging and engaging. James Paul Gee, a reading professor in the School of Education at the University of Wisconsin-Madison, believes. “Learning isn’t about memorizing isolated facts. It’s about connecting and manipulating them.” (Wired, May 2003, “High Score Education: Games, not school, are teaching kids to think”) A great game skirts the edge of the player’s level of competence, each new level pushing them to the limit of what they can do, enticing them to learn more. They are immersed in the game world and experience the flow of all their attention being powerfully focused – their mind working quickly, making the connections needed to meet the game’s challenges. After spending many hours with his students immersed in video games, Gee concluded that, “Young gamers today aren’t training to be gun-toting carjackers. They’re learning how to learn.” I see it every day. 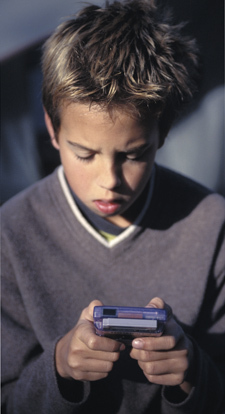 Seymour Papert, author of The Connected Family: Bridging the Digital Generation Gap, recognizes that “talking about games and learning is an important activity” and “encourages parents to engage in conversations with their kids about learning” (Game Developer, June 1998, “Does Easy Do It? Children, Games, and Learning”). That’s not a tall order for life learning families! I am always astonished when I look at the many different places Joseph’s interest in video games has taken him and the many things he has learned along the way. And to extend it further, I think this approach is wonderful for any parent whose child has a deep, passionate interest. Whether it is trains, collectible cards, video games or Harry Potter, take a few slow, deep breaths and help them fully explore their passion – you’ll be amazed at where the journey will take you! Pam Laricchia and her husband had been unschooling their three kids (who were ages 12, 10, and 7) for over two years when this article was published in 2004. They live and learn near Toronto, Ontario, Canada. You can read more about her books and her family’s experiences at her website www.livingjoyfully.ca.